I've been doing Must Read Giveaways each month for 2012, but April is special for me. Because on the 24th, my own book, Unraveling, will be out in the world. So instead of a Must Read Giveaway this month where I give away a book by someone else, I'm going to give away a signed copy of Unraveling. To win, simply fill out the form below between now and midnight April 20th! I'm excited about your book coming out! Even if I don't win, I still plan to read it. Thanks for the giveaway! I'm looking forward to reading your book, I've heard so many wonderful things! Thank you, for this giveaway!! Amazing giveaway, thank you so much! Can't wait to read the book! OMG! OMG! I would love to win Unraveling. I just cannot wait to read this book! =D Thank you! Awesome giveaway! Thanks for the opportunity to win Unraveling! My sis and I are super excited to read this book (mostly her though considering her name is also Janelle). Thanks for the awesome giveaway! Thanks for the opportunity! I can't wait to read it, I've heard nothing but good things! Thank you so much for the giveaway and also for making it international! :) I've been dying to get my hands on a copy because every review I've read has said that it's worth even more than five stars haha! Congrats on the release! Im really looking forward to reading it. I would love to read UNRAVELING thank you. It looks amazing. Ooh, very exciting. Thank you so much! Ooh, what a great giveaway! Thanks for making it international! I just finished reading unraveling as an bookstore employee I got the privilege of devouring your novel per release date) and I loved it!!! All I can say is there has to be a sequel please tell me you are writing a sequel?? Thank you for the giveaway. The book sounds great! OMG!! Thank you so much for the chance to win your book! I want to read it so bad!! Fingers crossed! Unraveling has been on my wishlist since the moment I heard of it. Thanks for the giveaway! Thanks for the giveaway :D I've been dying to read Unraveling, it sounds awesome! Thanks so much for the chance. Your book looks AMAZING! Love the thrilling cover, too! Thank you so much for this giveaway! I've been looking forward this Unraveling for some time now! Looking forward to Unraveling...Thanks for the giveaway! Thanks for the giveaway! Very exciting!I can't wait to read this book! Thanks for making it internationally. Awesome!!! This book looks so awesome. Thank you for the chance to win! I can't wait to read your book! Thanks so much for the giveaway! Great giveaway! I've seen your book on different blogs and it seems really interesting! Good luck to everybody! Thank you for the international giveaway, your book looks and sounds great! I've already preordered my copy..but i can't pass up the chance for a singned copy! So excited about this giveaway! Just read the preivew and I need it now. Hope there will be more. Thanks for the giveaway! I can't wait to read it!! I've been super exited for this book!!! Yay, I got to read your book from Edelweiss and just ADORED it! Especially Janelle. And Ben. And Janelle and Ben together. And multiverse theory :) I would love to win a signed copy of it!! I'm sososo excited for this, congratulations and thank you so much for the giveaway! normally, I don't enter competitions to win books I intend to buy anyway, but signed copy!! Thanks for the chance at winning Unraveling, no just the book but signed edition! This has been one of the books on my to-read list on goodreads for months I can't wait for its release! Thanks for the opportunity to win Unraveling! Thank you for the giveaway! 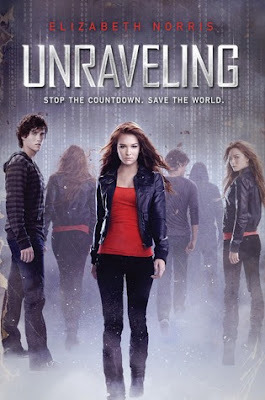 I can't wait to read Unraveling when it comes out. This books sounds exciting! Can't wait to read it! I have only read rave reviews about the book and I can't wait to read it myself!! Thanks for the giveaway and tour!! Thanks for the chance to win! I am so excited about reading Unraveling! SQUEE! Thank you so much for this wonderful opportunity and congratulations on the upcoming release!